As Overseas Costs Rise, More U.S. Companies Are 'Reshoring' : Parallels For decades, American companies have sent their manufacturing work overseas. Extremely low wages in Asia and elsewhere reduced costs. But as costs overseas go up, a growing number of American companies are rethinking that business model. 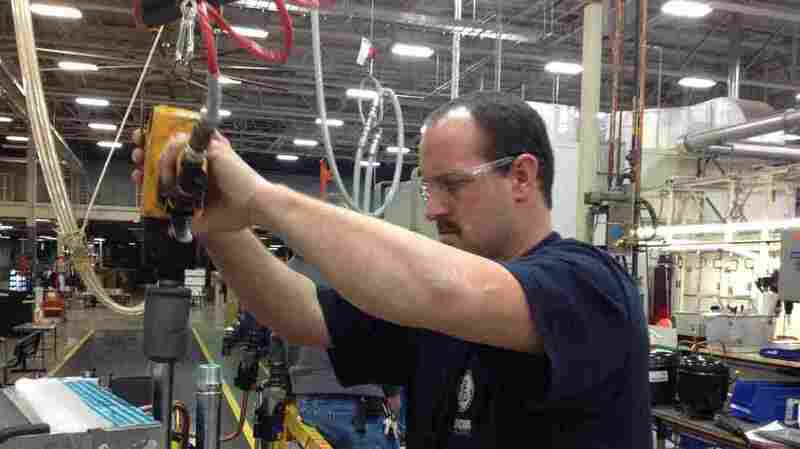 Paul Gibson works on the Geo-Spring hybrid water heater at General Electric's Louisville, Ky., plant. For many years, GE outsourced manufacturing of the water heater to a company in China. But in 2009, it decided to bring production back to the U.S.
For decades, American companies have been sending their manufacturing work overseas. Extremely low wages in places like China, Vietnam and the Philippines reduced costs and translated into cheaper prices for consumers wanting flat-screen TVs, dishwashers and a range of gadgets. But now a growing number of American companies are reversing that trend, bringing manufacturing back to the United States in a trend known as "reshoring." Kim Freeman, a spokeswoman for General Electric Appliances, walks into a sprawling plant in Louisville, Ky. Machine noise is thunderous in the brightly lit room. The finished product, a hybrid water heater, is not much to look at — tubby, about 4 feet tall, with a few knobs and levers. But it's actually a high-tech, energy-efficient appliance. For years, GE outsourced manufacturing of the water heater to a company in China. In 2009, GE did the math and, considering rising wages overseas as well as climbing transportation costs, decided to bring production back to the U.S. The company wanted more control of the product, especially the technology that goes into it, says Freeman. To maximize savings, the appliance had to be completely redesigned. GE ripped apart one of six massive factories at the complex in Louisville, and built a water heater assembly line. It worked out a new, lower-wage structure for employees, and brought in experts to help reduce waste and time. Everything was geared to reducing costs. A month later, GE also began producing high-end refrigerators domestically, the type with the bottom drawer freezer. Until then, GE had produced that type of refrigerator in Mexico. Mike Chanatry, the head of manufacturing for GE Appliances, says the decision to bring some of the manufacturing back to the U.S. was a risk — but one worth taking. He says GE faces stiff competition from LG Electronics and Samsung, up-and-comers in the world of appliances. Other major companies — Ford and Whirlpool among them — have also brought back some of their products. But so have many smaller companies, says Harold Sirkin, a senior partner at Boston Consulting Group who has been surveying companies about reshoring. "In the beginning of 2011, for the most part, most people thought that this was just impossible, that there would be no reshoring to the U.S., that everything was going to China, manufacturing was leaving the country and will never come back," says Sirkin. "And I think the striking thing is how much that's changed in the last three years." Sirkin says at least 200 companies have already returned, and there's been a dramatic jump recently in the number of companies saying they're seriously thinking about it. Sirkin says a huge factor has been rising wages overseas. Pay in China has risen at least 15 percent annually for the past few years. Wages in China are still comparatively low compared with the U.S., but there are other important factors. "You went to China because it was just so cheap you couldn't help it," he says. "But if you've got the engineers and people in the U.S., and the customer base in the U.S., you'd like to be close to the customer. It gives you a shorter supply chain." Also, the cost of shipping has shot up, while domestic energy prices are low. If this trend continues, Sirkin believes 20 to 25 percent of products that were sent offshore will eventually return to the U.S. But the challenges in bringing back manufacturing can include finding enough skilled labor, says professor Arie Lewin, director for the Center for International Business, Education and Research at Duke University. Harry Moser, president of the Reshoring Initiative, which helps companies figure out if it's worth bringing manufacturing back to the U.S., agrees that making the move can be a challenge. And, he says, "There's challenges of getting the consumer to understand that the product is made in the USA and to give a little extra preference to that product." Moser says Wal-Mart's decision to put $50 billion more worth of American-made goods on its shelves over the next 10 years is dramatically important, even if Wal-Mart qualifies that by insisting those products don't cost more than versions made overseas.